Battle the churning rapids of the Ganga past the temples and ghats of Rishikesh. And at the end of the rafting, you’ll also get a chance to try body surfing and cliff jumping in the river. Uttarakhand is full of natural beauty and offers great variety to the adventure-seekers who visit. It is home to many of the most famous peaks in the country, and two of the major rivers of India – the Ganga and the Yamuna – start from here. 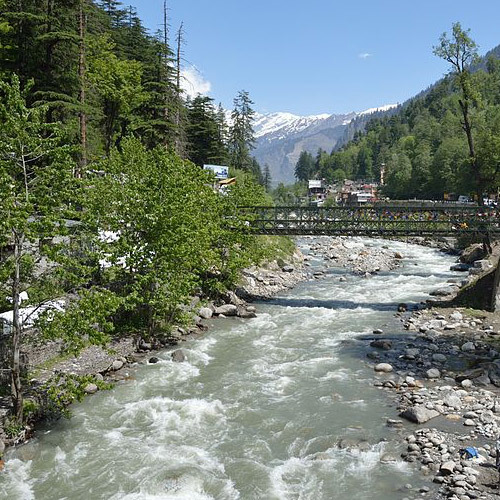 The entire state is dotted with sparkling lakes and streams that are formed by melting glaciers, and it is covered in pine and deodar forests. The most famous spot for river rafting in Uttarakhand is in Rishikesh. It is a spiritual destination for Hindus, but is now becoming popular as the ‘gateway to the Himalayas’, thanks to its convenient location and booming adventure industry. 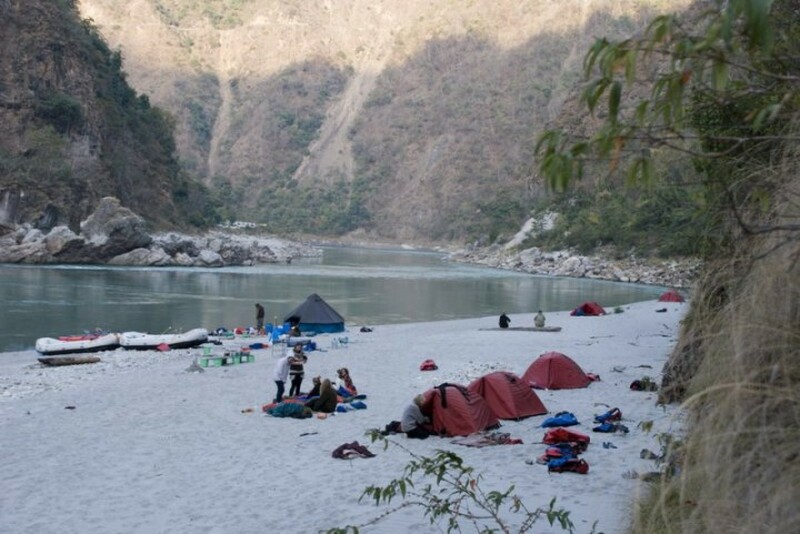 Apart from rafting in Rishikesh, you can also go bungee jumping, camping, and mountain-biking. Check out these top adventures in Uttarakhand that you won’t want to miss while you’re here. The Ganga swirls down from the mountains in to Rishikesh, running wide, green, and cold. 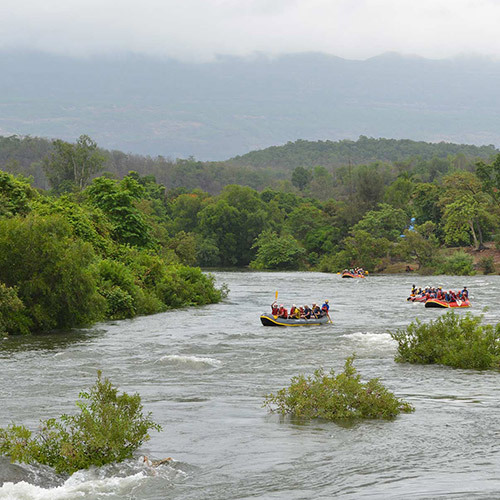 It is an awe-inspiring sight, especially when you can see the stretches with roaring rapids. There are different grades of rapids on offer, so you can choose from the milder Grade I and II, to the epic boiling stretch of the Grade IV rapids. No matter which package you choose, you’ll have a thrill-a-minute rafting session! After that, when the water becomes less turbulent, you’ll paddle past the many ghats and prayer areas of Rishikesh, heading towards the quiet stretches where you can jump into the water. 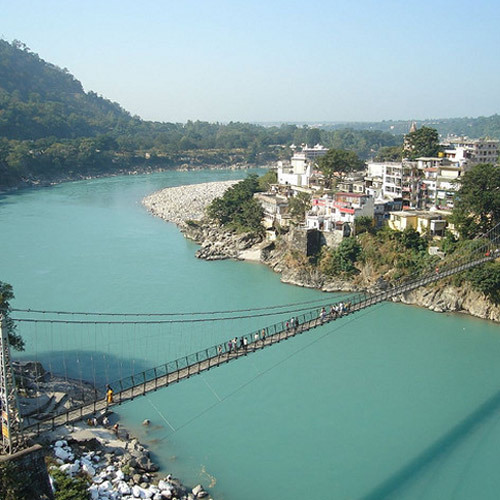 The centre of Rishikesh is for the temples and facilities for religious visitors. 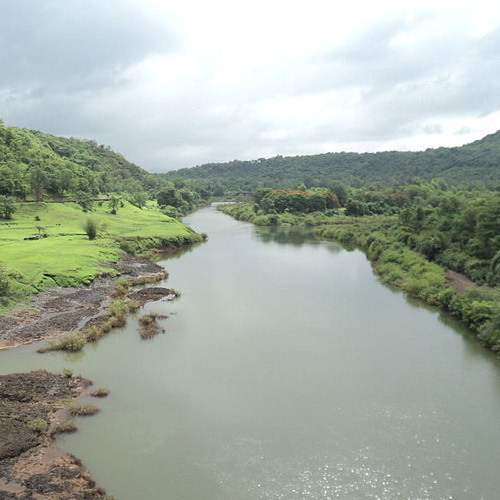 Around that, along the river and its tributaries, there are campsites set up to cater to adventure seekers and travellers. Most of these campsites offer river rafting as well as camping packages. Depending on your budget, you can stay in tents, cottages, or rooms. A regular rafting and camping package usually involves all meals, a campfire in the evening, and a session of Ganga river rafting the next day. Ganga River Rafting – Which stretch is right for me? Rafting on the Ganga can be customized to suit your requirements. For families with young children, there are Rishikesh rafting packages that are shorter and will cover fewer rapids. You can choose from the 9 km stretch (for families with kids), 16 kms stretch (good for beginners), or longer Ganga river rafting packages like 24 or 32 kms. From the 16 km stretch onwards, you’ll be meeting all the most famous rapids, like Double Trouble, Golf Course, Return to Sender, The Wall, and more. 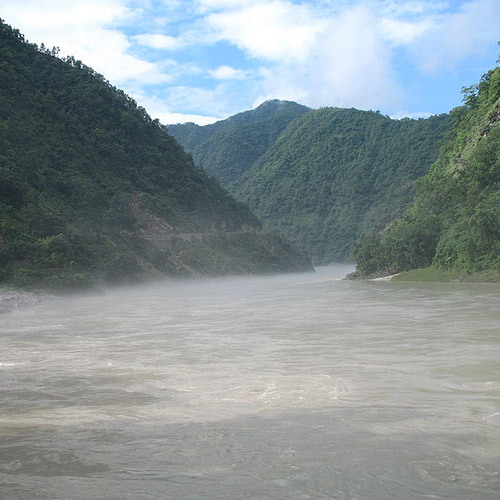 Enjoy the thrill of rafting on the rushing Ganges over a stretch of 12 km. It takes about 2.5 hrs to complete the trip and participants face famous rapids like Return to Sender, Roller Coaster, Golf Course, Clubhouse, Initiation, Double Trouble. Pictures and videos of the trip at a cost of Rs.800/- if informed in well in advance. 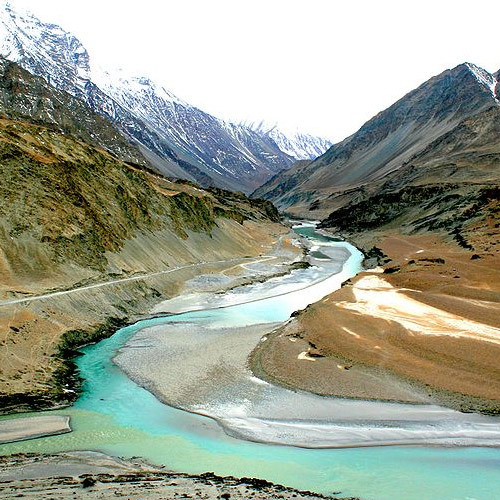 The Tons is a tributary of the Yamuna river that flows through the Gharwal region of Uttarakhand. On this expedition, we run several rapids ranging from Class III to Class IV+/V, with whitewater sections separated by a hundred yards or less of flat water. The sheer adrenaline rush and magic of taking on 40 kms of quality whitewater from Gyunhatti till Tiuni, can only be described as one of the finest whitewater experiences in the country, and is not for the faint-hearted. Camping in the lap of nature, amongst the thickly forested hills of deodar, pine and chestnut, combined with short treks to the surrounding areas, make this a memorable getaway from the summer heat. What is the best time to go rafting in Uttarakhand? The best rafting season in Uttarakhand is during the summer months of March, April and May, when the cold water is very tempting. But during the monsoon months, all the way till September or October, the rafting season in Rishikesh is strong, thanks to the added force of the water. After that, you can still go rafting, but the water gets very cold. Can beginners go rafting in Uttarakhand? Yes, you can go rafting in Uttarakhand even if you have no experience. The longer stretches have bigger rapids, so if you want to start off with shorter stretches, this can give you a short rafting experience. All rafting operators in Uttarakhand provide helmets and life jackets, and you will always be accompanied by an experienced rafting instructor. What should I carry for river rafting in Uttarakhand? You don’t need much for rafting in Uttarakhand. Make sure you are dressed in light, quick-dry clothes that will not get heavy when wet. Avoid denims, saris, and skirts. You should be careful not to carry anything valuable in your pockets, and make sure your sunglasses have a strap to hold them around your neck.